Listen here for audio of radio interviews about films/TV from a Christian perspective with Pastors Ted Giese and Todd Wilken on IssuesEtc.org where Christianity meets culture. A.D. The Bible Continues (2015) By Mark Burnett and Roma Downey, producers of The Bible(2013) and the theatrical release Son of God (2014). When the producers of The Bible (2013) and the theatrical release Son of God (2014) followed up their miniseries and film with A.D. The Bible Continues (2015) IssuesEtc took the time to look at each episode as they came out and provide a recap. This was actually a large undertaking. For each episode notes were produced and then segments were produced. In this post those notes are being made available along with the audio from the IssuesEtc segments. A.D. The Bible Continues is being released on DVD/Blu-Ray and is now available on digital download. What does this mean? It means that some well meaning congregations may consider watching this miniseries in small groups at church and/or it means that well meaning Christian folk may pick it up as an easy substitution to reading their Bibles (A sort of CliffsNotes approach). Now should this happen the viewer needs to be prepared for what they are getting themselves into. These notes and radio segments may also serve as a resource for those who want to look at this miniseries in a discerning way. Please take the time a read/re-read the Book of Acts chapters one to the end of chapter ten. On the one hand A.D. The Bible Continues isn't pushing some of the ideas often associated with cable television religious docudramas and documentaries. For example Mary Magdalene is not presented as Jesus' wife or girlfriend, and while she is very close to the disciples she is not one of the Apostles. The miniseries is not pushing a radical modern sexual agenda. It also doesn't explain away miracles. It may not present them in the best way but it doesn't favour a modern rationalist approach. Basically the viewer is not getting a Jefferson Bible or a Higher Critical take on the text. On the other hand A.D. The Bible Continues doesn't stick closely to the text of Scripture. Mark Burnett and Roma Downey seem to be equally enamoured with the fictional story that they are telling alongside the Biblical account of the growth of the early Christian Church. They spend a considerable amount of time focused on fictionalised stories revolving around Caiaphas and Pilate and their wives along with a rouges gallery of historical figures like the Emperors Tiberius and Caligula and totally fictional Zealot "freedom fighters." They do draw some of their information from historians like Flavius Josephus but they often disregard things like the accepted dates for the death of individuals like Tiberius Caesar. There disregarded for Historical details also shows up when they deal with the text of Scripture. A good example of this is when they skip over Saint Paul's description of what happened with him after his coming to faith in Christ, in Galatians 1:16-20 Paul writes, "I did not immediately consult with anyone; nor did I go up to Jerusalem to those who were apostles before me, but I went away into Arabia, and returned again to Damascus. Then after three years I went up to Jerusalem to visit Cephas and remained with him fifteen days. But I saw none of the other apostles except James the Lord's brother. (In what I am writing to you, before God, I do not lie!)" 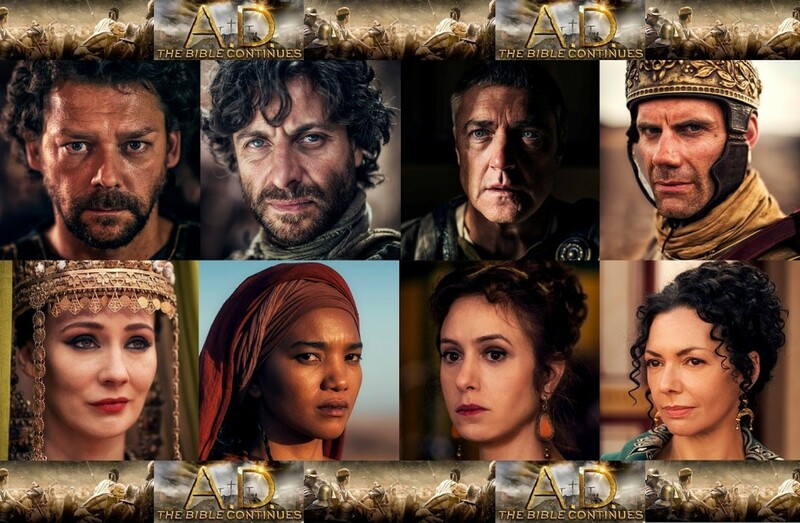 This three year period is set aside by the makers of A.D. The Bible Continues in favour of having Saul/Paul go immediately down to Jerusalem and meet with Peter and the disciples. The way they deal with God, particularly the Holy Spirit is a problem - for instance instead of using the Biblical pronoun "He" for the Holy Spirit they use "it." These insights and many more dealing with errors, omissions and contradiction to the text of Scripture, and in some cases to the historical record, can be found in the notes and conversations posted below.